I purchased this watch for my husband for Christmas, He absolutely loves it. He has always worn Tag heuer brand which is a lot more expensive to purchase as well as maintain. He only wears this luminox watch now....it looks great dressy or casual and can be worn while working out or going to dinner. We will be purchasing one for our son for Christmas this year. This user was entered into a sweepstakes after submitting their honest review. The Colormark Chronograph from Luminox is the pinnacle of the highly successful Colormark Navy Seal series. The 44 mm case, caseback and unidirectional ratcheting bezel are all made of molded carbon-reinforced polymer. The crystal glass, a hardened and tempered mineral glass, is highly scratch-resistant. The double-gasket, push-in crown and construction of the watch case ensure water-resistance to 200 meters. Although you may not need to accomplish a daring night-time mission, this official Navy Seal watch offers dependable night visibility for diving, fishing and hunting thanks to Luminox' self-powered night vision tubes illumination. This rugged watch includes chronograph and date functions with a rotating diving bezel for convenience and a sturdy rubber strap for durability. Actually a really good piece! Swiss watch but made in China throws a red flag. Arrived to me with crinkled protective face cover. I have contacted Luminox and was recommended to physically take it to an authorized dealer for further inspection for verification since Luminox does not mention "overstock.com" or "overstock" as an authorized seller. I took it to an authorized jewelry store and it was a bonafide Luminox watch. It's real. well worth the price! Watch didn't work. Ultimately bought two watches and had to return both AND ultimately had to pay shipping for receiving nothing. Really disappointed in this watch. Have had to send it back twice, and purchase my own strap. The gas filled tubes which mark the hours have fallen off and are floating on the inside of the watch, the knob to adjust the time has also broken and required me to send the watch back in. Thank god I purchased the extended warranty, not that I even want to use it at this point. Never had these many problems with lesser price watches, would not recommend this brand to anyone in the market for a high end tactical watch. its lightweight, durable, comfortable, functional, accurate, water resistant and attractive. plus it glows in the dark for 25 years. what more could you ask from a wristwatch? if you can get your brain around the price, you are really going to be pleased with this one. I purchased this watch for my husband for Christmas, He absolutely loves it. He has always worn Tag heuer brand which is a lot more expensive to purchase as well as maintain. 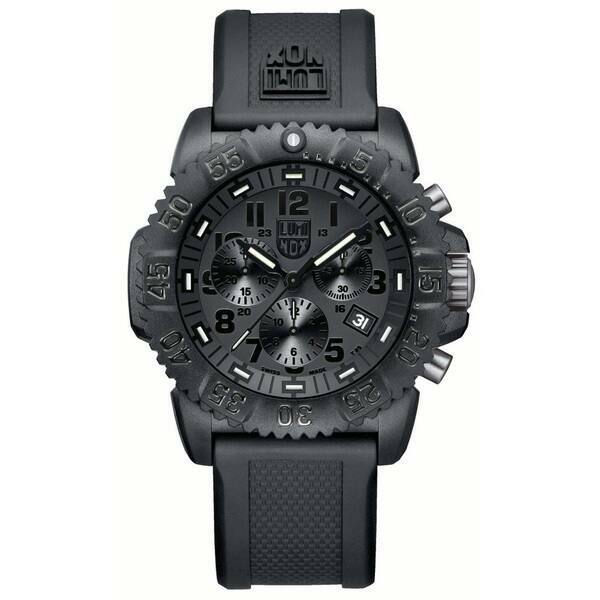 He only wears this luminox watch now....it looks great dressy or casual and can be worn while working out or going to dinner. We will be purchasing one for our son for Christmas this year. Excellent time piece!! Great durability and tactical watch. I bought this for my husband and he loves. Fast delivery and excellent quality. Would recommend this brand to anyone. Unbelievably nice watch!!! Quality very evident. The watch is extremely lightweight, was very surprised!! Loved the watch, but stopped working (battery possibly) after less than 6 months. Overstock allowed me to return they don't answer their phones. Buyer beware. Just what my husband wanted for work and play! "I see the "Country of origin" is China, but this is supposed to be a Swiss made watch. Is this an authentic Luminox watch or not?" In 1971 the Swiss government passed a law defining what is or isn't Swiss made or Swiss movement. Here is a reasonable well outlined explanation of the De lege lata: Swiss watch A watch is considered Swiss, according to the Swiss law if: its movement is Swiss and, its movement is cased up in Switzerland and; the manufacturer carries out the final inspection in Switzerland Swiss watch movement A watch movement is considered Swiss if: the movement has been assembled in Switzerland and, the movement has been inspected by the manufacturer in Switzerland and; the components of Swiss manufacture account for at least 50 percent of the total value, without taking into account the cost of assembly. From 1 January 2017, the law set the minimum at 60 percent. I hope that answers your question. "On this particular watch, does the long hand and the chronograph hand glow in the dark as well? Or just outside markers and the hours hands? Please advise." Hello magicmet21, this item features luminous hands as well. Thank you for shopping with us. I had purchased it for my son and fell in love with this functional timepiece. "what kind of manufacturers warranty does this come with? (besides the additional jewelry protection plan)"
Hello mevaldez, this includes a one year limited distributor warranty. Thanks for shopping with us! "Does this watch have a capacity to set a daily alarm?" Thank you for contacting us, Rs_clifton. This watch does not have a capacity to set a daily alarm. Please let us know if you have any further questions.